The driver (who was not the keeper) tried to buy a parking ticket, but the machines would not accept the right money. An appeal was made, but Charlotte from Minster came back with a load of tripe, including the gem "Schedule 4 of the Protection of Freedoms Act 2012 states that you are permitted 28-days in which to Appeal this Notice". This is of course, a part of the Act which Charlotte made up. As no appeal was allowed, the keeper decided not to pay, and some weeks later a claim form from Gladstones dropped through the door. No letter before claim was received. Mr S was represented by Mrs S, who used the The Lay Representatives (Rights of Audience) Order 1999. The usher was not aware this could happen, but Mrs S had brought a copy of the Act. Minster were represented by an advocate hired by Gladstones. As is common, Gladstones did not send any paperwork to the court or the defendant. Court rules do not apply to Gladstones, as they have been given an exemption by Lords Chief Justice on High William Hurley and John Davies. Unfortunately the judge had not been informed of the exemption, so threw the case out immediately. She said that she had Mr S's paperwork and a letter explaining that he hadn't received Gladstones witness statement. She asked if this was still the case and Mrs S confirmed that it was. She also explained she hadn't received anything from Gladstones either, at which point the Gladstones representative became very apologetic. The judge asked the representative what she was hoping for and explained to me that she might not need to hear the defence at all. The representative didn't really give an answer so the judge asked if she was pushing for an adjournment; at which point Mrs S got a bit nervous. The representative said she would be happy to adjourn if the judge was, so the judge applied some sort of test with three limbs and the test failed on the first limb. The judge then went on to say that there was no excuse for Gladstones not submitting the paperwork on time, especially as we as lay people had managed to do so. She had nothing from the claimant to examine and neither did we which put us at a disadvantage, but had given Gladstones a considerable advantage given that they had a copy of their Witness Statement. She also pointed out that she didn't take too kindly to Gladstones wasting the court's time, therefore she was striking it out. Costs of £10 were awarded. Unfortunately quite a few courts have not heard of Gladstones free pass to ignore the rules. This is of course completely unfair. The Prankster suggests that the Lords Chief Justice on High do a whistle-stop tour of the country, pointing out where the judges are going wrong and lecturing them or the error of their ways. If they do, they should probably pack light, and just take a toothbrush. If the machines had allowed the driver to pay the £1.50 in the first place Minster Baywatch would be a few hundred pounds better off than they are now. The DVLA has now confirmed a massive data breach has occurred with parking companies selling data to MIL Collections in contravention of the KADOE contract. Many thousands of parking charges are potentially affected. Parking companies have been selling data to MIL since February 2015. However, the DVLA has only now confirmed that data which was obtained from them using the KADOE contract should not have been provided to MIL, and this therefore puts the operator in breach. Data obtained from other sources is not affected. The IPC released this statement about their operator Northwest Parking Enforcement. Further to your complaint that Northwest Parking Enforcement is in breach of their KADOE contract with the DVLA by engaging Mil Collections to enforce their parking charges under the terms of a debt-purchase arrangement. We have made the necessary enquiries with the DVLA who have clarified there had been a misinterpretation of the terms of the contract and that subsequently Mil collections should not be considered a ‘sub-contractor’ under it. The company would therefore be required to obtain the prior consent of the DVLA in order to engage in such an arrangement irrespective of whether they retained a significant degree of control over the data in question. Accordingly, the arrangement that was in place may have put the operator in breach of the KADOE contract but this is limited to cases where the data was requested under the terms of the KADOE contract. It should be noted that this does not apply where the information was obtained or confirmed through other means. Since the point has been clarified, we have been informed that the company is no longer referring keeper data that has been obtained under the KADOE contract to Mil collections and, as such, this issue should not arise in the future. This means that to protect themselves, motorists should consider whether to appeal windscreen tickets immediately, thus giving away their details, or to wait until their data has been obtained from the DVLA, thus giving them added protection. The DVLA have not yet said what they will do about the potentially thousands of parking charges already sold to MIL. I am writing to enquire the DVLA position regarding the data protection obligations for keeper data when a parking company passes this data to a third party. It is clear in the current KADOE contract that the operator has a number of obligations in this matter and clause D5 sets out 'Restrictions on the disclosure of the data'. The operator can (a) disclose data to a sub-contractor acting as the customers data processor or (b) a sub-contractor engaged in debt collection, and (c) to no other person without the prior written agreement of the DVLA. When data is passed on in (a) and (b) a number of safeguards must be in place. The person receiving the data must have a written contract which requires the sub-contractor to abide by the requirements in schedules 2 and 3 of the KADOE contract. These contain conditions such as naming all the people who can handle data, ensuring that have a record of appropriate training, using anti-virus software, etc. The conditions also require that any charge is pursued in line with the old OFT Debt Collection Guidelines. It has come to our attention that a number of parking companies are disclosing keeper data by selling the parking charge to a third party. We would expect the conditions in which the DVLA allow this would be at least as strict as those required for a sub-contractor engaged in debt collection; otherwise an operator could simply circumvent DVLA requirements by setting up a new company and immediately selling on the debt. However, the DVLA may have different views. We would therefore welcome clarification on this point. If these companies have not written to the DVLA asking for permission to disclose the data in line with clause D5.1(c) of the KADOE contract, and if it is the DVLA position that the data should be kept secure in these circumstances then there are a number of matters I would like to raise. Do you have a date when you will be able to reply to this (or if you are the wrong contact, please can you point me to the right person/department). MIL – It was reported that MIL, who are members of the BPA but not the AOS, have been approaching operators and offering to purchase outstanding PCN’s for £1. In addition, the FAQ’s on their website contained information from exchanges with the BPA which had been taken out of context. The terms of MIL’s membership was currently being discussed with the member and KR advised that he had spoken to the DVLA about this and the DVLA was reviewing its policy. Has the DVLA finished reviewing its policy yet? If so, please can you inform me of the results. If not, I will provide you with information regarding MIL collections activities which breach the OFT debt collection guidelines to help with the policy making process. On 9 November a further follow-up email was sent. I have not yet received an acknowledgement of this. Do you have a date when you will be able to reply to my earlier email (or if you are the wrong contact, please can you point me to the right person/department)? Following our discussions at the DVLA-BPA Focus Group on 4 November we have been considering the position regarding MIL Collections and the ‘sale of debt’ model generally. 1. What information would MIL receive from the parking company as part of buying the debt? For example, does this include evidence of the VRM, the breach of terms & conditions, landowner agreement, and any data the parking operator may have obtained from DVLA (keeper name and address)? This is key as we need to understand whether MIL would be buying the debt, or the debt and the data obtained from DVLA. MIL would be buying everything that they would need to follow up on the debt – this will include, if appropriate, the vehicle keeper details that you have supplied to the operator. 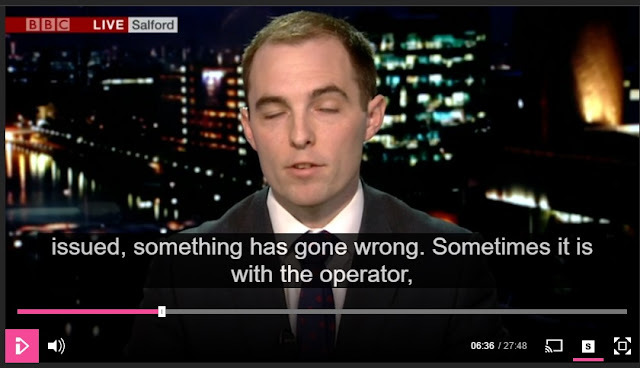 There are some instances where the operator has not applied for data – for example an on-screen ticket where the motorist has surrendered their details in an appeal letter. With regards to the case, I am sure that MIL would require any and every piece of background detail. 2. If MIL buy the debt do they keep all money recovered or do they give some money obtained back to parking company? Have they got different models? If so, we need details of these. From what I can gather there are various models where MIL buy the debt and pay a proportion of anything they recover less their costs to the operator – other models see the debt sold on completely and nothing to the operator – I sense that it’s all negotiated. 3. What contracts would be in place between MIL and the parking company and what do they cover? I am sure that there is some contract in place but I have not seen these – we have not audited them – as they are IPC members, you could ask them? I have discussed this issue with colleagues and due to the further information we now know about MIL there are concerns about DVLA data being passed on in such circumstances. In the absence of a formal sub contracting relationship between operators and MIL, the operators should seek permission from DVLA before forwarding on any DVLA data to third parties. On the basis of the information we have at present, DVLA would be unlikely to agree to DVLA data being forwarded on to third parties in the absence of the assurance that comes with a formal sub contract. I’m sure both these issues will run for a while yet, so please let me know if you have any further queries. I can confirm that the situation regarding debt collection companies such as MIL is that where a parking company does not have a contract in place with the debt collector they must seek permission from DVLA before forwarding on any DVLA data to third parties. It is clear then that the DVLA have been fully aware of MILs activities since at least 18 October 2015 and possibly 3 June 2015. The DVLA has a history of failing to protect keeper data from companies like Proserver, PACE Recovery, and now MIL Collections. 1) What will the DVLA do about the date incorrectly sold to MIL Collections? 2) How can the DVLA restore public confidence, given that it takes them several years to protect motorists from the time they first become aware of the breach? In the June 2016 Parkex brochure MIL claimed to take 70% of cases to court and to have spent over £100,000 in court fees. This would means somewhere between 2,000 and 4,000 cases were taken to court, giving some idea of the scale of MILs operation. 1) In all the court cases you have take out against motorists, you have claimed you have fully purchased the debt from the operator. This does not fir with the DVLA statement "From what I can gather there are various models where MIL buy the debt and pay a proportion of anything they recover less their costs to the operator". Have you been deceiving the court when you tell judges the debt has been purchased outright? 2) Why do the deeds of assignment with parking companies which you claim are signed on different dates all look exactly the same? Were they really signed on different dates, or have you been deceiving the court? Now the DVLA have confirmed that operators were in breach of their KADOE contract, it may be that motorists have a data protection claim against any parking operator who sold data to MIL. Mr X was helping his brother move into his new flat in London at Heath Parade. He followed and parked up behind the moving van outside his flat in a spot marked "Loading Bay". Just after he pulled in the PCM operator started taking photos of the car. He left the car and asked if it was Ok to park here but got no response, He read the sign on the wall and decided not to park so promptly moved. Mr X represented himself. PCM UK used a local solicitor hired by Gladstones. The judge had already reviewed all the papers submitted and tore into the solicitor.The Judge started by asking him where the facts of case were as they were nowhere to be found in the bundle they had submitted. He said the only details which explained properly what happened were in Mr X's bundle. He went on to grill them about why Mr X had been fined when he was unloading in a loading bay. He then pointed out that the signs are inadequate and unreadable from the car; the sign is too far up on a wall and not legible. He explained you cannot charge somebody who can't read the sign and know the terms on the site. He dissected PCM UK's evidence, showing they had proved nothing - just a car with Mr X inside for 2 minutes and 14 seconds. There was no time noted when Mr X came into the bay and no time when he left and that 2 mins 14 sec was not enough time to read signs as the driver was still in the car. He stated that as Mr X hadn't been given the opportunity to read the terms at the site there is no claim here and dismissed the case. Everything was over and done with in 10 minutes. Mr X was not allowed costs. This Heath Parade spot is a well known scam site patrolled by Mrs Sunglasses and has previously been blogged about several times. Parking Cowboys has an article explaining this. It was amusing that the judge expected a Gladstones bundle to contain any actual details about the parking event. Gladstones use template "statements of case"** and witness statements which do not explain anything but waffle on in general terms about the legitmacy of parking charges. **in the loosest sense of the word. Mr Hamilton has a flat in a private estate that he rents out. It comes with a parking space. The management company for the estate contracted New World Facilities Essex to patrol the estate and 'ticket' anyone parking without authority. Last year, between tenants, he was parked in his space to do repairs and came out to find a £100 ticket on my car. He had a notice in his car window to say that he was the owner of the flat, so the attendant knew that it was his space. He therefore considered the charge was not valid. Eventually the parking company sold the alleged debt to MIL Collections, who processed to issue a claim. The representative of MIL turned up and the usher encouraged parties to negotiate in a side room, to cut down court business. Mr Hamilton asked "So what are you offering?" to which the reply was "Nothing, I guess you're not either?" Mr Hamilton retorted "No, I'm happy to sit here all day to be heard" and they both left the side room..
Once called for the hearing, the judge hadn't read the witness statements so both sides sat there for ten minutes whilst he went through them. MIL's chap was given first chance to speak and he mumbled through a bit of the beginning of his case, but was interrupted by the judge asking him was he aware about primacy of rights regarding my enjoyment of my parking space and that the management company couldn't make a contract to take this away. MIL wasn't sure about this but was pressed a few times. The judge said that was the deciding factor. As an aside the judge was a bit miffed about the bit in Mr Hamiltons witness statement listing the previous dropped or uncontested cases and said that it shouldn't be there. Mr Hamilton replied that it seemed relevant as they rarely ever won a case and just used the threat of court to extract money that wasn't due. The judge was satisfied with this explanation. Full costs were awarded to Mr Hamilton. The MIL representative was very pleasant and was happy to chat outside. He confessed he wasn't surprised to lose as he loses every MIL case he goes to. He didn't seem to have prepared particularly. It is a quirk of the British Legal System that a company can exist and make a tidy profit pursuing debts which do not exist and whose representatives lose every hearing they go to. This is because they vast majority of the British public are scared witless of the court system, do not understand it, and are happy to make bad decisions on that basis. They fear the loss of their "credit rating" to the point of irrationality, and do not realise that is is perfectly possible to lose a court case without it affecting their rating; only if they lose and do not pay up is any effect had. Lastly they fear "costs" and do not realise that costs are strictly limited on the small claims track. Clever and unscrupulous people play on these fears, continually escalating charges with fictitious costs they know will not be upheld if the claim gets to a hearing. Enough people pay up at inflated levels as soon as a claim is issued that the actual basis of the claim is immaterial. Companies like MIL for instance, only bother to check with the parking company what the claim is about a few weeks before the final hearing. The initial claim is worded using bland template statements which do not state the basis of the claim. They then throw together a template witness statement at the last minute and trot off to court hoping the defendant does not turn up, or that they have failed to research their company. It is likely Mr Hamilton has a valid data protection claim against the parking company and MIL for misusing his personal data to pursue a parking charge which did not exist. The sum of £250 would seem to be the going rate. The Parking Cowboys web site has a good article on this topic. Marks Tey Hotel got rather less than they bargained for when they employed Civil Enforcement Ltd to manage their car park. Specifically, they didn't get proper car park management, but did get a large headache as their legitimate customers are being targeted. Customers are now vowing never to return. The story is detailed in this newspaper report. The lesson to landowners is clear. If you contract somebody to manage your car park, make sure you have the right to cancel charges issued to genuine customers. Also make sure you have the right to cancel the entire contract if things are not going well. Mark Teys Hotel have only themselves to blame for this. While there are a number of reputable firms who offer car park management, Civil Enforcement Ltd and their sister company Creative Car Parks are not one of them. A quick internet search would have told them of this. Mark Teys Hotel have another surprise in store when they eventually cancel the contract. Civil Enforcement Ltd are well known for resurrecting old charges, valid or not, as soon as a contract is canceled, and taking the landowners genuine customers to court. Perhaps Mark Teys Hotel should have a word with the co-op to find how that turned out for them. The owners of Civil Enforcement Ltd obfuscate their dealings through a network of many companies. including at least these ones. In 2016 companies were required to declare 'Persons with significant control'. It does appear on the face of it that this is not being complied with in any meaningful way for these companies, and The Prankster would welcome any clarification from the persons with significant control of these companies. ES Parking have discontinued yet another claim regarding the Spinningfields site in Manchester. It is not entirely clear why this particular case has been cancelled. 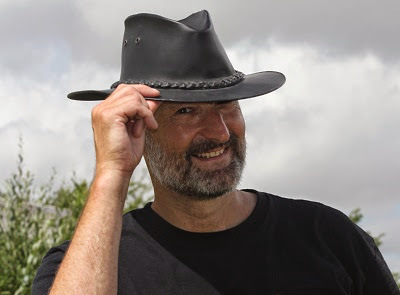 Brian Hargreaves saves money by going to court himself and not spending money on lawyers. If he has cases in two courts, he cannot be in two places at the same time. He also does not stray far from his home. ES Parking are based in Preston, so if the court is not close to there chances are it may be cancelled. Alternatively, he may just be feeling things are too hot in Manchester as judges are wising up to the fact his claims are not valid. Whatever the reason, the motorist is pleased. ES Parking Enforcement Ltd v Ms Q. C0GF4C5K. Preston. Ms Q's vehicle stopped briefly in the Spinningfields Estate, Manchester. There was no signage nearby and no road markings to indicate this was not allowed. ES Parking Enforcement have a spy CCTV camera installed on this street which takes photos of cars which stop. ES Parking Enforcement used photos from the spy camera to issue a parking charge which Ms Q contested, and the case eventually ended up in court. Gladstones could not be bothered to follow practice directions or the judge's instructions - that kind of legal nitty gritty is only for the hoi-polloi, not for the paragons of virtue inhabiting Gladstone Towers. As is their habit, the witness statement was therefore served late. It should have arrived on 13th January, but was only dated 16th January. This is not an isolated incident and therefore is a clear indication of Gladstone's arrogant attitude towards the court process. Ms Q served a skeleton argument to the court and Gladstones ahead of time to give them clear indication what was going to hit them it they attended court, and to give them a chance to discontinue. They failed to take their chance. Brian Hargreaves turned up and represented himself to save costs. He discussed the case for about 45 minutes with Ms Q before they went in, with quite an open conversation. He said he wasn't going to bother seeing if Ms Q would settle but did she know that she could get a CCJ if she failed. He suggested he had won a few cases and that several people settled at court prior to the hearing. He said that it wasn't worth bringing a solicitor and that he was only there to save the reputation of the company. He wanted to know if the Parking Prankster was going to be there, who he described as a 'pyjama wearing, toast eating nothing to do all day kind of person'. The judge gave him a roasting from the outset and and he turned a lovely shade of beetroot for the rest of the hearing. The first point of contention was that ES Parking Enforcement had not completed the particulars of the claim properly, that the judge had told ES Parking Enforcement this before, and that the judge was angry that he was there again with the same documents. Regarding the actual claim, the main point was that ES Parking Enforcement were trying to establish a contract existed but the judge said this was not possible. The judge said he would like to take it higher but could only rule on the case today. The claim was dismissed and Ms Q was awarded her full costs. After the hearing Ms Q spoke to the usher who said she had been asked by the judge to pass on his thanks and congratulations on the legal paperwork and defence she put forward. No doubt it was a joy to receive something clearly laid out and on time as opposed to the shoddy stuff Gladstones throw together. The Prankster will put down his toast and brush the crumbs off his pyjamas before commenting. Mr Hargreaves has had a torrid time in court this week. Judges in Manchester and Preston have wised up to the fact there can be no parking contract when you briefly stop your car. Mr Hargreaves now has dates with destiny in Wigan and Huddersfield. No doubt he will find out there whether judges talk to each other or not. Although the judge will no doubt be amused by Gladstones template claim that the signs were bound to have been seen, the reality of all the photographic evidence submitted by both sides is that there were no signs in sight. Such a blatant lie in the witness statement is disrespectful to the court and the defendant. Whoever threw this witness statement together 3 days late in Gladstone Towers should be ashamed of themselves. Finally, despite what Brian Hargreaves suggests, losing a court claim does not automatically mean that a CCJ will remain on record against you and damage your credit score. A CCJ only remains on the register if you fail to pay the judgment within the allotted period. There were 2 PCN’s of £85. Mr R's vehicle overstayed twice in a free 1 1/2hour car park, as detected by ANPR. The keeper required £100 from ParkingEye to name driver. There was no other defence entered. Judgement was in favour of ParkingEye. Total of £480 including £210 for unreasonable behaviour. Mr Milton represented ParkingEye. Mr R represented himself. At the commencement Mr Milton, informed the court he was an unregistered barrister, instructed by LPC Law, instructed by ParkingEye. The DJ questioned Mr Milton. Having satisfied himself, he agreed to continue if the defendant agreed. The defendant, not realising the significance, agreed. ParkingEye claimed the defendant’s vehicle had parked in Home Bargains Pwllheli on 29th January and 3rd February 2016 and on both occasions had overstayed the free one and a half hour free parking. The incidents were captured by ANPR. 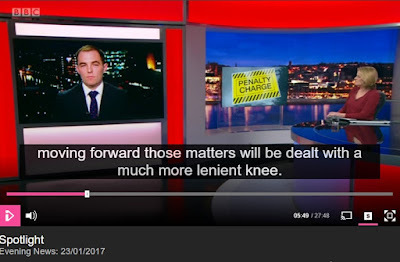 ParkingEye submitted that as the defence had denied being the driver, but offered to supply the name of the driver for a fee of £100 and no other defence had been submitted, the key point was keeper liability. ParkingEye established –under strict scrutiny of the DJ, that they had complied with POFA 2012 and as a result the keeper was liable. ParkingEye asked the defendant why he’d asked for £100 and the basis of that claim. Defendant had no basis whatsoever and stated he got the idea from Facebook! The DJ explained the defence was wholly misconceived and gave the defendant an opportunity to raise other matters. The defendant stated ParkingEye was a 3rd party having no legal right and the charge was excessive. The DJ explained ParkingEye's contract was contained in the bundle and the charge was not excessive referencing ParkingEye v Beavis. Judgement was made for ParkingEye and awarded £170 plus £100. ParkingEye sought an additional £210 due to the defendant’s unreasonable behaviour. 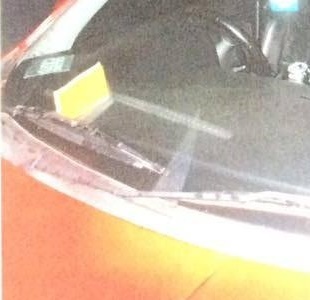 The DJ discussed this at length explaining failure to engage other than demanding the fee for naming the driver was unreasonable and awarded the additional £210. Total £480 to be paid in 42 days. The Prankster has reported several court hearings where motorists were awarded costs for the unreasonable behaviour of the parking company. Perhaps the most notable was the £2000 awarded in the Gladstones-powered ill conceived case of Homeguard v Jopson. Today the boot was on the other foot, It is important to note that you should only defend a case if you have a valid defence, and that something you 'found on facebook' is not necessarily going to help. Also, arguments which have won cases in the past may no longer be valid as case law evolves. It is also worth noting that the only law that counts is the law you bring to court. It it quite possible that Mr R could have won his case with different arguments. Even the fact that ParkingEye was a 3rd party may have been a winning point if the contract was carefully dissected and the correct legal points made. As a case in point, we should consider the open goal handed to the defendant at the start of the hearing, and the rights of audience of Mr Milton. All defendants should read this article in today's Law Gazette and take a copy to their hearing. The conditions under which solicitors’ agents can be exempt under the LSA 2007 are: that the individual must assist in the conduct of litigation; must be under instruction from an authorised person (usually a solicitor) and that the hearing must be heard ‘in chambers’. ‘All individuals undertaking work as solicitors’ agents are urged to consider carefully whether they fulfil the requirements upon accepting every new instruction and when attending at court,’ the council said. Essentially, this means that a solicitor's agent attending on their own is not likely to have rights of audience and may face 12 months free bed and board. Defendants should also take a copy of the McShane v Lincoln judgment, available here. a) There would have been no-one from ParkingEye to ask for this. Mr Milton would not be allowed to speak, and faces being ejected if he did. b) Even if there was, there would have been no reason to award it. Mr Milton would be there as an observer. 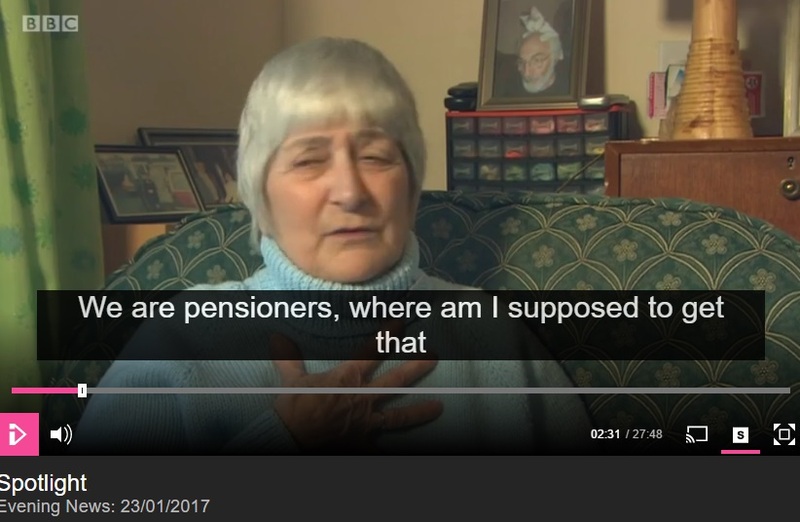 If ParkingEye pay £210 for an observer to turn up that is their own business and not one which the courts would be concerned with. Radio Devon and BBC Spotlight have featured the Crossways car park in Paignton. Car parking operator Premier Parking Solutions have hit on a new wheeze to make money from car parking; install a system which is not fit for purpose. The system requires you to enter your registration number, but crucially is using outmoded technology which accepts non-valid registrations and registration numbers of vehicles which are not in the car park. This has caught out huge numbers of motorists who made innocent mistakes. Pensioners Cherry and Donald Smith were caught out when Cherry accidentally typed YB309 instead of Y309 for the last few digits of the registration. Some days later they received a parking charge of £100. As this is a huge proportion of their weekly pension, Cherry was naturally worried. The charge also ruined what was previously a very pleasant weekend. Premier Parking Solutions started court action and only stopped when the media became involved. However, they have plenty of other court cases in the pipeline which the media do not know about and are therefore still ongoing. Local MP Kevin Foster has been inundated with complaints regarding this car park and considers it skirts the edge of morality to issue charges in such circumstances. 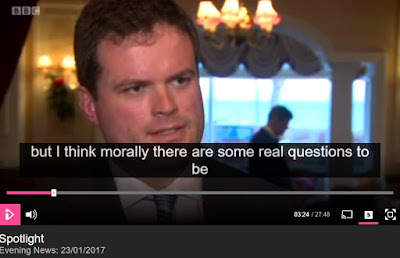 Will Hurley, a solicitor who specialises in taking motorists to court for inflated amounts, appeared on television to defend the charges. His firm, Gladstones Solicitors, loses large number of cases through procedural errors, poor legal knowledge and general incompetence. The twitter hashtag, "You've been #gladstoned", is used to refer to claimants persuaded to take out a no-hope case by greedy solicitors. 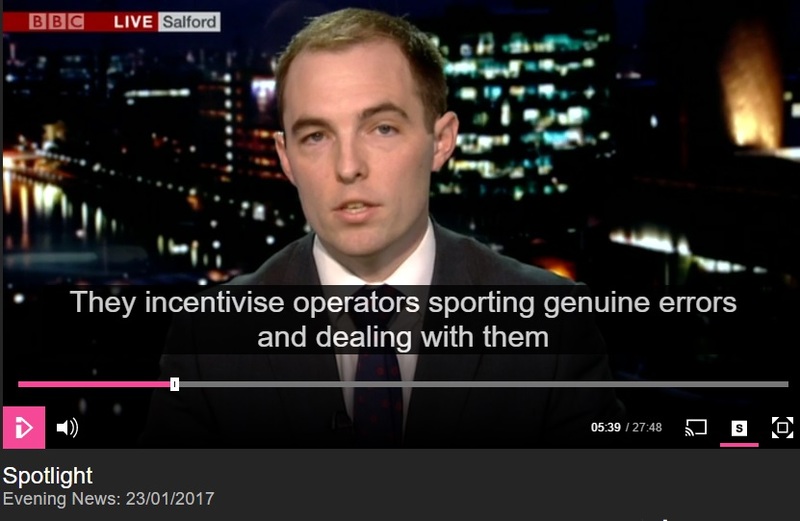 Will stated that new schemes are in place to incentivise operators to cancel charges when a genuine error has been made. However, he did not offer any details and therefore this must be viewed as puff and flim flam until real details emerge. 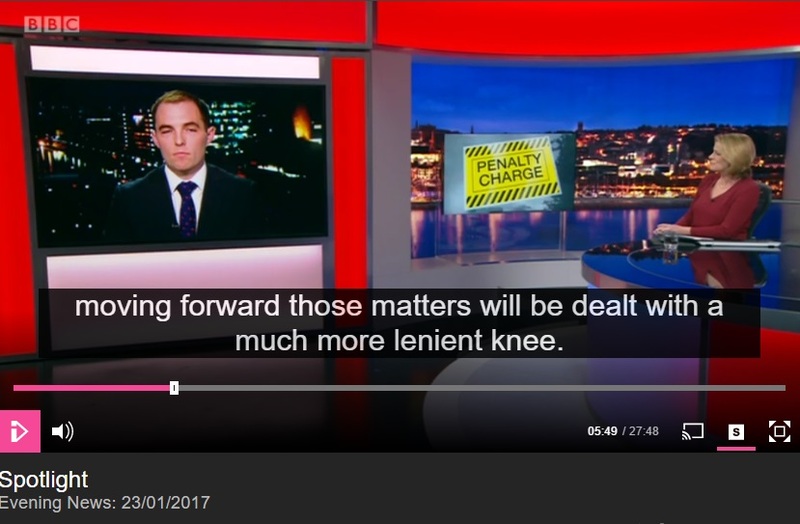 He promised future charges will be dealt with much more leniently, or, as the TV subtitles put it, with a much more lenient knee. Will blamed the sudden rash of charges being issued on the poor technology which had been installed to save money. Of course, Will is fully aware that the technology has really been installed to make money, not save money. 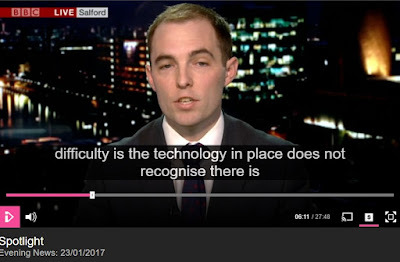 In the Prankster's opinion the technology used is outdated and not fit for purpose. Proper car park managers would install machines which only accept valid registration plates, and also which only allow a plate to be entered if the ANPR cameras have detected that the vehicle is currently present in the car park. Such systems have existed for a very long time. The Prankster blogged about such a system back in 2014 and followed up in 2015. Freedom of information requests show that with such a system in place very few parking charges are issued - if it is made easy for motorists to comply with the rules, then they will. Of course, the problem is that this does not help greedy parking companies who want to issue as many charges as possible. One big problem with systems which require a registration to be entered is that they make no allowance for people with Dyslexia. Dyslexia is a protected characteristic under the Equality Act 2010, and the NHS estimate that 5-10% of the population suffer from some form of this. One common issue dyslexic people have is the transposition of letters and digits, and the inability to recognise this has happened. Thus they may enter AB10 YOG instead of AB10 OYG. The Prankster is fully aware that Premier Park takes dyslexic people to court for getting their registration mixed in this way, that they refuse to cancel charges even when they are aware of the dyslexia and that they have no process in place for a reasonable adjustment. The Prankster strongly believes that dyslexic people should not be viewed as a cash cow by the parking industry, and that they are in breach of the Equality Act 2010 for behaving in this way. The very system itself is not fit for purpose and should be updated to use modern processes which only allow registrations of cars present in the car park. The charge issuing process should also be updated to search for close-match registrations and abort the charge if one is found. The appeals process should be updated to carry our further searches if the motorist has stated a ticket was purchased. All these are reasonable adjustments which result in no loss to the parking company because a ticket for parking has been purchased. So, what should the future of parking be? Should we strive for systems which create a fair parking regime and use technology to minimise errors? Or should we follow the example of the worst of the parking companies, helped by Will Hurley, and create complicated parking systems where the rules are hard to keep to and the chances of issuing a charge maximised. One typical example is a car park disguised as a layby in Heath Parade. Will Hurley's firm have filed claims against large numbers of motorists tricked into stopping at this 'lay-by'. Is this really the future of parking? Designing sites to scam as many motorists as possible? Parking Management is a privilege and not a right. Parking companies and trade associations who are not committed to a fair parking regime have no place in this industry.